My grandparents Albert Studd (born 22 January 1877) and Keziah Miriam Nice were married on 5 February 1910. My father, also Albert, was born on 21 June 1910 - only five months after his parents were married(!) In addition, Albert senior had "disappeared" before my father was born. Subsequently my grandmother re-married and had a daughter Violet - my father's half sister who I always knew as Auty Vi. Aunty Vi told me that there was a rumor that grandfather had gone to Canada, so, although it was a long shot I went to the local library in Portsmouth where they have copies of Canadian telephone directories. Fortunately Studd is a fairly unusual name and there weren't too many. Murial ******, who lived in Barrie, Ontario transpired to be the grand daughter of Ernest Frederick Studd - my grandfather's older brother. He was born on 13 December 1877 and married Maria ***** (born 1880) on 23 June 1878. He died on 4 April 1959. Murial had documents showing that her grandfather had sailed to Canada in 1911. Did the two brothers sail together? There was an Uncle Alfred but he was older than Frederick, being born on 16 April 1871. 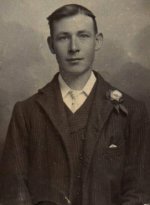 It seems , therefore, that the photograph shows Albert Studd, who being born in 1887, was Frederick's younger brother. Both Fred and Beatrice were born in England. A third child, Harold, was born in 1915 in Toronto, so this photograph must have been taken before this date. Left - a page from a Bible which Albert's mother gave him. This tells us that (a) she knew he was was leaving England and (b) the date he left. My second contact was a Mr and Mrs Studd. Mrs Studd wrote to say that her father-in-law was Albert Studd and that he travelled from the UK to Canada in 1910 with his brother Ernest! Mrs Studd gave Albert's date of birth as 22 January 1879; he died on 17 May 1939. She said that she could hardly conceive of her father-in-law being a bigamist, but conceded that it could be the case. Mrs Studd also sent me some photographs of Albert Arthur, his mother and two sisters: Alice (born 1883) and Olive (born 1890) - see left and right. 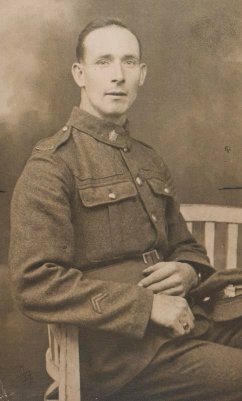 Albert joined the Canadian Army and returned to England during the First World War and visited his mother and sisters - but no record of him visiting his wife and son. There we had proof - Albert Studd, born in 1887 with two sisters, Alice and Olive. I was so excited that I visited ***** and her family in Canada, meeting up with my father's half-brother and his wife, both vigorously healthy in their 80s! ***** and I combined our researches to create a sizable family tree. Note that Susannah, Sarah, Alfred, and Edith, recorded in the 1881 census were not recorded in the 1891 census. Conversely, Emma was present in 1891 but not 1881. Alice was born in 1883, Albert in 1887 and Olive in 1890. Notice that the 1901 census includes a Clive Studd who although old enough to have appeared in the 1881 census was not recorded there. Was this a confusion between a hand written C and O: Clive and Olive? Clive is clearly recorded as a son in 1901, but was this a false conclusion based on the confusion of Clive and Olive.